When you think of famous musicians who have honorably served in the United States Armed Forces, it’s impossible not to go first to Elvis Presley! Photos abound of the handsome, young Elvis in a crisp Army uniform. In fact, the airport was mobbed with screaming fans when he arrived for basic training. Upon being drafted, Elvis Presley entered the United States Army in spring of 1958 and served until spring of 1960, receiving his discharge from the Army Reserve in 1964. At the time of his draft, he was the most well-known entertainer in the Armed Forces. And despite being offered a safer, more plum role in the Secret Services, Elvis chose to serve as a regular soldier. 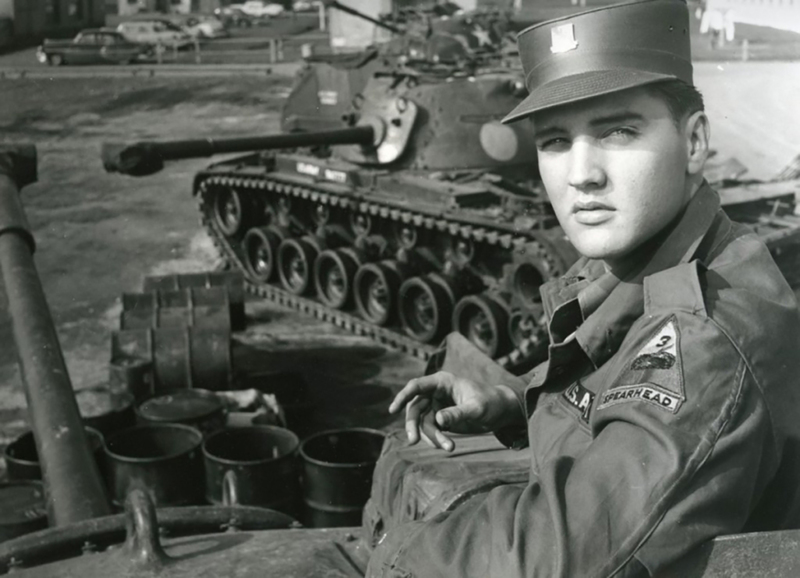 During his active military career, Elvis served in Germany for around 18 months as a member of the the 1st Medium Tank Battalion, 32d Armor. When he was discharged, he returned to Hollywood and began making a series of films to build on his post-service popularity not just among youth audiences, but also among older adults. In fact, it may be his military service that helped him earn the adoration of a more adult audience. However, Elvis isn’t the only famed musician to serve their country. Let’s look at eight other musicians you might be surprised to learn served their country in the United States Armed Forces. Tracy Lauren Marrow, known as his stage name Ice-T, is one of many young adults who found themselves turning to military service as a way out of a tough situation. Dealing drugs on the streets of Los Angeles to support himself, he knew he needed to turn his life around when his daughter was born. Marrow enlisted in the Army and served four years in the 25th Infantry Division at the Tropic Lightning Schofield Barracks in Hawaii. During his time in Hawaii, Marrow served as a squad leader at Schofield Barracks. It was during this time that he purchased musical equipment and began work to hone his skills, save money and prepare to launch a career in music. As Ice-T, Marrow went on to a dynamic career first as a Grammy Award-winning musician, rapper and songwriter, then as an actor on television on the hit show Law & Order: Special Victims Unit. American rock legend Jimi Hendrix remains one of the most influential guitarists of all time, despite an incredibly short career of only four years. Well known for his groundbreaking instrumentalization on electric guitar and his legendary performance at Woodstock, Hendrix entered the military as one of two choices given to him by police after being caught twice in stolen cars: it was prison or the military. Hendrix enlisted in May 1961 and was assigned to the 101st Airborne Division and stationed in Kentucky. Hendrix next completed paratrooper training and was given the prestigious Screaming Eagles Award in early 1962. However, it seems that Hendrix wasn’t well suited to military service and was given an honorable discharge just six months later. While Hendrix later claimed that he received a medical discharge after breaking his ankle in a parachute jump, he was actually discharged due to “unsuitability” for service. The Man in Black was first a man in uniform. Johnny Cash, singer, songwriter, and one of the bestselling musicians of all time, had a career that spanned decades, genres, and generations. Before he was an award-winning musician, Cash served in the United States Air Force. At age 18 and directly after high school, Cash enlisted and attended basic training at Lackland Air Force Base and technical training at Brooks Air Force Base in Texas. He was assigned to the 12th Radio Squadron Mobile of the Air Force Security Service in Germany as a Morse code operator, intercepting Soviet transmissions. His earnings in the military allowed him to buy his first guitar while stationed in Germany and he actually formed his first band, the Landsberg Barbarians, in the Air Force. Upon his discharge, he took advantage of the GI Bill to attend a radio announcing course in Memphis before launching his country music career. And if it weren’t for his time in Germany, we probably wouldn’t have this version of “I Walk the Line” to contemplate! Singer, songwriter, and grassroots activist, Willie Nelson is one the most famous voices in country music. He’s well-known for his work supporting American farmers and advocating for the legalization of marijuana through his role as co-chair of the National Organization for the Reform of Marijuana Laws (NORML). He grew up in Texas during the Great Depression. After tumultuous early years, he moved to Arkansas to live with his grandparents, and he began playing honkytonks to avoid field work. After he left high school, Nelson enlisted in the Air Force and served for about nine months before receiving a medical discharge due to back issues. And while he didn’t serve very long, he has stayed passionate about veteran issues throughout his storied career as a singer, songwriter, author ,and actor, advocating for increased medical care for veterans and supporting veteran advocacy groups, helping to raise awareness about homelessness among veterans. After graduating from high school in Oakland, Burrell took undergraduate classes in communications. Discouraged by his lack of success, he was at a crossroads. He vacillated between considering work as a drug dealer or a job in the military. He ultimately decided to join the United States Navy for three years, serving as an Aviation Storekeeper 3rd Class at the Naval Air Station at Moffett Field in Mountain View, California until his honorable discharge. Jazz legend John Coltrane was one of the most influential saxophonists and composers of all time. Known for his own recordings (more than 50) and his collaboration with other jazz greats, including Miles Davis and Thelonious Monk, Coltrane died young of liver cancer but leaves behind an exceptional musical legacy. To avoid being drafted by the Army in 1945 during World War II, Coltrane enlisted in the Navy on the day the first atomic bomb was dropped on Japan. He trained as an apprentice seaman and was sent to Pearl Harbor. During this time, his musical talents came to light, and he joined the Melody Masters, the base swing band. By the end of his service, he had assumed a leadership role in the band, and it was during this time that he made his first recording with other Navy musicians, playing alto saxophone on jazz standards and bebop tunes. With a career that has spanned more than six decades, Tony Bennett is the living voice of American pop standards, jazz classics and, more recently, contemporary duets with other legends such as Amy Winehouse and Lady Gaga. He has earned 19 Grammy awards, two Emmy awards and is a Kennedy Center Honoree. He has sold more than 50 million records worldwide. ‘However, before he was Tony Bennett, he was Anthony Benedetto, who was drafted into the United States Army in November 1944 during the final stages of World War II. As a replacement infantryman, he served across France and into Germany, and in March 1945, he joined the front line. During active combat, Bennett narrowly escaped death several times and he participated in the liberation of a Nazi concentration camp, where American prisoners of war from the 63rd Division were also freed. During his service, he also sang with the Army military band under the stage name Joe Bari, and played with many musicians who went on to have post-war music careers. Once discharged, Bennett studied at the American Theater Wing on the GI Bill. Country music singer, songwriter, and producer, George Strait, AKA the “King of Country,” is considered by many to be one of the most popular and influential country music artists of all time. George Strait is famed for his neo-traditionalist style, his cowboy look and 60 No. 1 Billboard country music hits. In 1971, Strait eloped with his high school sweetheart, Norma, then joined the United States Army. He was enlisted in the Army from 1971 to 1975 and was stationed in part in Hawaii. While there, he launched what would become a lifelong career, singing with the Army-sponsored band called Rambling Country. Strait’s commitment to the men and women of the Armed Forces has continued throughout his illustrious career. He even served as the spokesman for the Wrangler National Patriot program, which raises awareness and funds for American wounded and fallen military veterans and their families.